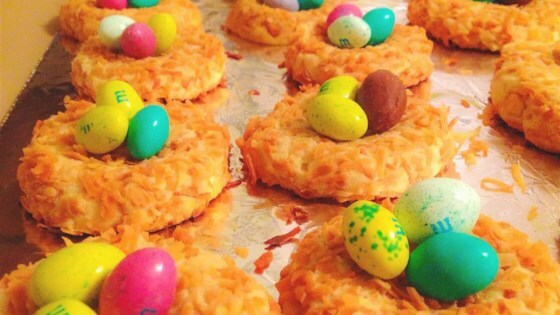 "Make cookies that look like bird nests! Pretty for school spring celebrations or Easter. You can use egg-shaped candies in lieu of the jellybeans, too." In a medium bowl, stir together the crispy rice cereal and coconut. In a large saucepan, combine corn syrup, brown sugar, peanut butter, and vanilla. Cook over medium heat stirring frequently until the mixture comes to a boil. Remove from heat, and stir in the coconut and cereal mixture until it is well coated. Set the mixture aside until cool enough to handle. Form the mixture into balls, then make an indention in the center so that they look like little bird nests. Place two or three jelly beans into each nest. My teacher made this for our bakesale, but instead of jelly beans she used miniature candy eggs. It's cute and tastes great either way! These tasted much better than I expected. On my second batch, though, I added more peanut butter and corn syrup so they would stay together easier. These did not stay together good.